Set it and forget it! The strength of the neck and straight-through design holds better tuning for a stress free performance. Silver soldered construction withstands changes in humidity and temperature without warping. Superior tone, sustain, and resonance. No heel at the joint allows easy access to your highest frets and the curve in the lower body is designed for optimal comfort. Even the wiring is securely housed in the durable copper! Absolutely no wood! 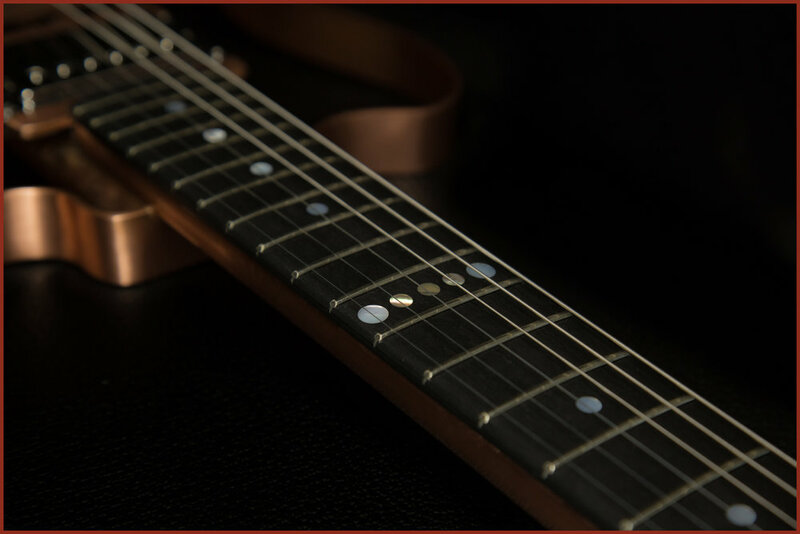 Each guitar features a hand made copper body and a Richlite fiber composite fretboard. Multiple hardware and finish options make every Tone.a.cane guitar completely unique. Tone.a.cane was named by my 9 year old son, who said the guitars sounded like a “hurricane of tone”. After I was fortunate enough to perform at a club on Beale Street on a trip to Memphis, Tennessee, I was inspired to start building cigar box guitars. Ultimately I discovered that I wanted a unique design for the neck of the guitar and started using copper pipes to create a tubular construction. I’ve always loved the unique properties of copper; it's a metal that can be 100% recycled (copper pipe in your basement could have been recycled out of a ring that Cleopatra once wore!) and is a fantastic green alternative to using endangered forest products. 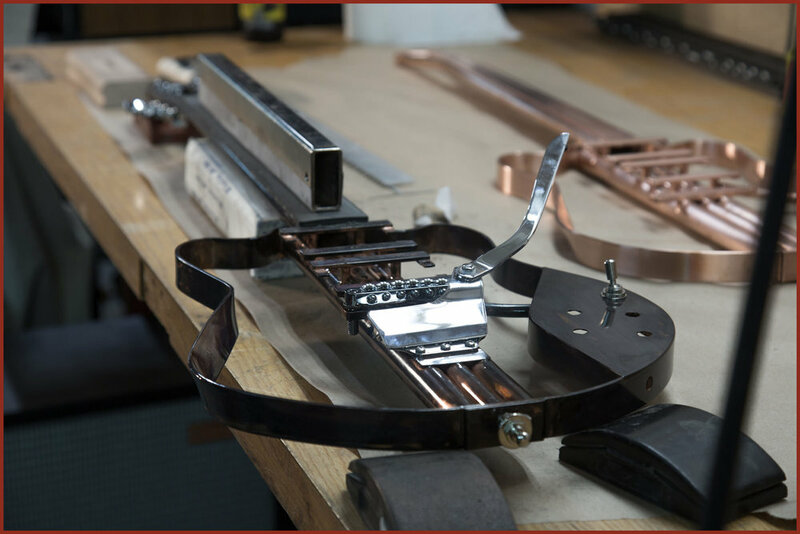 When I realized the potential for exceptional tone and sustain when resonated through the copper pipes, I began designing guitars solely out of copper. 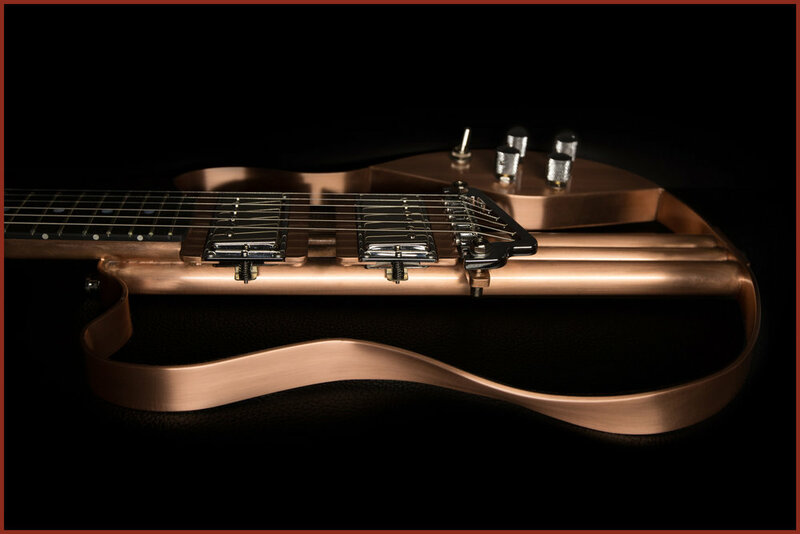 Thoughts of how to create the world’s finest copper guitar consumed me, and I would lay awake at night thinking about how to improve playability, sound quality, and aesthetics. It took more than three years and dozens of iterations to design the guitar you see today, and I couldn't be prouder to share them with the world! As raw as it gets. We do not brush or polish. These are made from raw copper stock, then protected with a heavy clear coat. Tone.A.Cane's signature sound with a vintage modern vibe. A nice and bright hand-brushed finish protected with a heavy clear coat. Tone.A.Cane's signature sound! Natural patina is created and sealed with a heavy clear coat. No two are exactly the same. Other colors available by request. Q: How much do they weigh? A: 7.5 - 8.5 lbs depending on hardware selection. Q: Does Copper sound better than tone wood? A: The simple answer is that copper naturally resonates and sustains much better than wood. This characteristic is preferred by most players. Q: Am I at a greater risk of electrical shock with a copper guitar? A: No. There is no big risk of electrical shock. Just like on wooden guitars all of the electronics are grounded. The risk is no different than that of a wooden instrument. Q: How does it react to climate change? A: Copper gets warm quickly and gets very cold. For comfort, It is recommended to bring your instrument up to room temperature before playing. The changes in temperature will not damage your instrument however. We have tested our guitars in many extremes. Q: Are other body styles available? A: Yes. We can design and accommodate most shapes and styles. Q: Do they age and patina naturally? A: They are sealed with a heavy clear coat to prevent oxidizing and protect the desired finish. Like most guitars they will age and parts of the clear coat can wear away over time. Some customers request a light clear coat to speed up the aging process. Q: Can the clear coat be re-applied? A: Yes. The clear coat we use is called Protectaclear by Everbright. It is self annealing and self leveling which makes it very user friendly when applied properly. Q: What happens if I dent or scratch my guitar? A: Light scratches in the clear coat can be annealed by carefully applying Protectaclear. Dents and deep scratches are permanent. We recommend using our locking strap buttons appropriately. Q: Do they dent and scratch easily? A: They are metal and some parts are thin. The thinner areas of the body are more prone to dents like that of a metal bodied dobro. Think of it like the outside of your car. Q: Does the neck dive or fall forward? A: No. We have designed our center of balance to allow for ease of playing. Q: Are they made in the USA? Q: Do you offer a discount for touring artists? A: Yes. We love to work directly with artists. Q: Do you offer bulk discounts? Q: Do you offer a warranty? A: Yes. We offer a lifetime limited warranty on all of our frames and craftsmanship. Ready to order your own one-of-a-kind copper guitar? Contact us for pricing and options!